Home garden tomatoes often offer more flavor than those sold at grocery stores. Ripening on the vine in the summer sunshine develops the flavor in the tomato in a way that can't be replicated in a factory hothouse. Planting established tomato seedlings outside in the garden is the quickest and simplest way to begin growing your own fresh tomatoes at home. 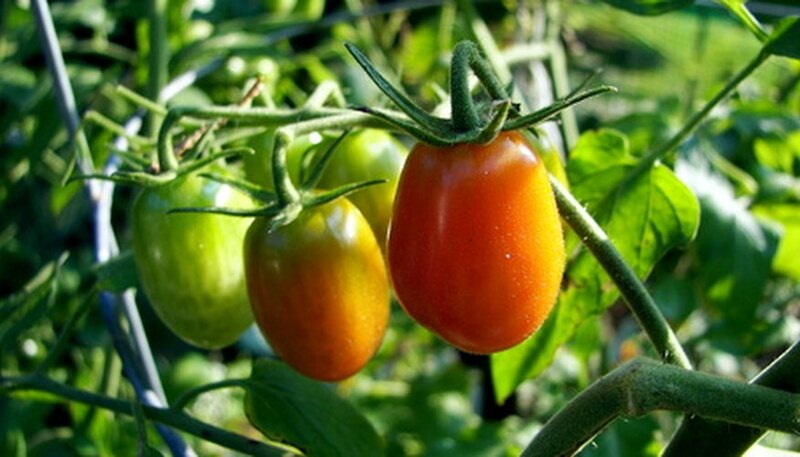 Tomatoes don't tolerate frost, so wait until all frost danger has passed in spring before planting the tomatoes. Set the tomatoes outside in an area protected from direct sunlight and wind beginning 10 days before you plan to plant them in the garden. Bring them inside at night and when temperatures are below 45 degrees Fahrenheit. Gradually move them into more direct sunlight over the course of the 10 days so they have time to adjust to outdoor conditions. Prepare a garden bed that receives full sunlight for planting. Lay a 2-inch layer of compost over the bed and till it into the top 6 to 8 inches of soil. Apply 2 lbs. of 5-10-10 analysis fertilizer per every 100 square feet of bed to add initial nutrients to the plants. Dig the planting holes 1 to 2 inches deeper than the height of the nursery pot, and make the holes slightly wider. Remove the plants from the pots and set them in the holes so they are planted deeper than they were in the pots. Refill the holes around the plants with soil and firm it lightly into place with your hands. Space the tomato plants 2 to 3 feet apart in rows, spacing the rows 4 feet apart. Water the garden thoroughly after planting the tomatoes, so that any air pockets in the soil collapse and the roots are in full contact with the soil. Water until the soil feels moist to at least a 6-inch depth when you stick your finger into it. Lay a 2-inch layer of mulch over the bed and around the tomato plants. Use straw or another organic mulch. Mulch preserves soil moisture by preventing evaporation and also inhibits the growth of weeds between the tomato plants. If you grow your own tomato seedlings indoors, start the seeds six to eight weeks before you plan to plant them in the garden. Garden centers may start selling tomato seedlings in mid-spring, but don't be tempted to buy these until the last frost date has passed. Otherwise, you may need to replace the plants in a few weeks when a late-season frost kills off your seedlings.